Perfection. It's an elusive quality�eternally sought yet rarely achieved. Fred Astaire and Ginger Rogers, however, made it their standard, and in 10 films produced between 1933 and 1949, this ethereal dance team defined the term. Whether stomping out exuberant tap routines, waltzing on air, or constructing devastating mini-dramas to the music of Gershwin, Kern, and Berlin, Astaire and Rogers rarely make a false move. With impeccable style and grace, they sashay across the floor, wordlessly infusing a multitude of emotions into twirls, lifts, and dips. The phrase "poetry in motion" surely was coined with them in mind, and their incomparable talent transformed an ordinary pastime into an art form. Most amazing of all, they make it look so easy. Because digitallyOBSESSED has already reviewed Top Hat, Swing Time, Follow the Fleet, Shall We Dance, and The Barkleys of Broadway, our discussion here will focus on the lesser-known Astaire-Rogers efforts that comprise Volume 2. Though entertaining and chockablock with thrilling ballroom sequences, these second-tier Fred-and-Ginger films pale a bit when placed alongside the aforementioned Tiffany titles. Yet from a historical perspective, they fill in critical blanks, allowing us to form a complete picture of this legendary partnership. Watching the team evolve from its embryonic stage is especially fun, and Flying Down to Rio is notable largely for that reason. If Astaire and Rogers hadn't teamed up for a Latin novelty dance called The Carioca atop a revolving circle of seven white grand pianos, nobody would remember this featherweight but thoroughly engaging early musical. An excuse to explore and celebrate Brazilian culture, America's burgeoning fascination with aviation, and the awe-inspiring beauty of Dolores Del Rio, Flying Down to Rio follows bandleader/pilot Roger Bond (Gene Raymond) and his ceaseless efforts to woo the lovely Belinha (Del Rio). Astaire and Rogers (billed fifth and fourth, respectively) appear early on as wisecracking second bananas, but viewers must wait 43 minutes for their momentous first dance, a dazzling specialty that's the centerpiece of a massive production number with kaleidoscopic overtones. As the chorus croons, "Have you seen The Carioca? It's not a foxtrot or a polka," Fred and Ginger lock foreheads and execute a stylish, energetic, and precise routine with a couple of comic accents. An all-too-brief Astaire solo comes later, but can't compete with the preposterous aerial finale, in which a bevy of intrepid chorus girls (led by Ginger) perform an array of synchronized movements while strapped onto the wings of various planes! Eat your heart out, Busby Berkeley. Despite limited screen time, Fred and Ginger so wowed the public that RKO rushed them into a vehicle all their own the next year. The Gay Divorcee was tailor-made to showcase the hot new terpsichorean team, but unfortunately the studio dumped all but one of the Cole Porter tunes from the Broadway original (in which Astaire also starred). That song is the gorgeous Night and Day, and it stands as one of the duo's most stunning routines, as well as a welcome respite from the flimsy story, which chronicles Astaire's pursuit of Rogers, who's trying to wriggle out of an unhappy marriage by hiring a professional correspondent (Erik Rhodes) to act as her lover. Misunderstandings and mistaken identities ensue, but the light comedy rolls pleasantly along until The Continental, a dazzling yet interminable 17-minute production number specifically designed to outdo The Carioca, stops the show cold (and not in a good way). Afterwards, The Gay Divorcee has trouble regaining momentum, but remains an agreeable diversion, thanks to the growing chemistry between its two leads. Astaire and Rogers proved they could carry a film, but their next assignment found them inexplicably relegated to supporting roles once again. Because of that, Roberta may be the most underrated of all the Astaire-Rogers pictures, but with a dynamite Jerome Kern score (that includes such gems as Smoke Gets in Your Eyes, I Won't Dance, and Yesterdays), the always marvelous Irene Dunne in the lead, and a solid story set in the glamorous milieu of Paris haute couture, it's amazing this Broadway adaptation lacks notoriety and respect. Sure, Fred and Ginger don't dance as much as we'd like, but their off-the-cuff tapping to I'll Be Hard to Handle is infectious fun and their beautifully choreographed pas de deux to Smoke Gets in Your Eyes personifies grace. The main romantic conflict concerns Dunne and Randolph Scott, but Astaire (as Indiana bandleader Huck Haines) and Rogers (as his former flame who's now masquerading as a Russian countess) steal the comic spotlight and file sparkling portrayals. The numerous fashion show sequences become a bit tiresome, but eagle eyes will spot a young (and platinum blonde) Lucille Ball in a non-speaking role as one of the mannequins. Of all the new-to-DVD titles in this collection, Roberta is the most entertaining, and remains one of the best Broadway transfers of the 1930s. On its heels came the cadillac Astaire-Rogers vehicles�Top Hat, Follow the Fleet, Swing Time, and Shall We Dance�films that would ultimately immortalize the duo. Carefree, however, shook up the fool-proof formula, and audiences of the day didn't quite know how to respond to this farcical trifle that takes some good-natured potshots at the fledgling field of psychoanalysis. Rogers plays Ralph Bellamy's wedding-shy girlfriend, who falls in love with the psychiatrist (Astaire) who's supposed to quell her nuptial fear. At a mere 83 minutes, it's the shortest Astaire-Rogers film, and its screwball plot and lack of Art Deco sets (dumped in favor of a rarefied country club atmosphere) lend it a distinctly different feel. The script�which requires Rogers to repeatedly wander around in a hypnotic trance�showcases Ginger's comedic ability, and as a result, Astaire plays second fiddle to his long-time partner for the first and only time during their cinematic association. Irving Berlin supplies the paltry but melodic score, which includes the charming Change Partners, lyrical I Used to be Color Blind (to which Astaire and Rogers dance in slow motion�a technique that really shows off their artistry), and The Yam, a rousing novelty number in the tradition of The Carioca and The Piccolino (but thankfully less than half as long as The Continental). Astaire also performs an intricate golf dance, and Hattie McDaniel shines in an unbilled bit (as�what else?�a maid) just a year before she would take home the Best Supporting Actress Oscar for Gone With the Wind. As an antidote to the contemporary Carefree, The Story of Vernon and Irene Castle turns back the clock and casts Astaire and Rogers in their only period piece. This genial, bittersweet biography of the famous ballroom couple�who not only popularized social dancing during the 1910s, but also revolutionized style and fashion�is also the most dramatic of the Fred-and-Ginger films, with issues of war and death coloring the romance and musical sequences. An affecting tenderness pervades the story, even in the early courting scenes, but historical constraints prevent the Astaire-Rogers dance numbers from achieving the level of creative invention we expect. The stars are handcuffed (or, in this case, foot-cuffed) by having to recreate routines the Castles made famous and adhere to another generation's prescribed moves and steps. Yet it's refreshing to see Fred and Ginger out of their traditional element and portraying an earlier incarnation of themselves. It also seems appropriate that at last they play a married couple; after eight films together, it's about time! Though Astaire and Rogers would reunite a decade later for The Barkleys of Broadway, The Story of Vernon and Irene Castle really marked the end of their celebrated partnership, and proved to be a fitting finale. As they dance off into the clouds, spinning and twirling to a sentimental suite of strings, they not only end their film, but also an era. We may never see their likes again, but thankfully, this magnificent DVD set keeps Fred and Ginger very much alive...and kicking. Image Transfer Review: If you're going to release the complete Astaire-Rogers catalog, you'd better do it right, and Warner has, remastering all 10 films so they look as crisp and vibrant as the dances on screen. Even Flying Down to Rio, released 74 years ago, looks spectacular, with deep blacks, excellent contrast, and a beautifully varied gray scale. Grain has been minimized across the board, but without sacrificing the warm film-like feel these musicals need to weave their spell. A few patchy stretches afflict every disc, but that's to be expected considering the material's advanced age; likewise, faint nicks and scratches occasionally appear, but only merit a passing nod. Even the most maniacal Astaire-Rogers fan would be loath to criticize the image quality of this impressive set. Audio Transfer Review: The audio also earns fine marks, thanks to the removal of surface noise and reduction of distortion and hiss. A tinny quality still afflicts the earliest films in the collection, but that's due to the era's more primitive recording equipment. Dialogue is always easy to comprehend, and the musical numbers benefit from a slight but noticeable volume boost that enhances fidelity and immerses us more fully in the duo's high-stepping magic. Extras Review: As mentioned above, Warner has gone to great lengths to make this collection truly special, and classic movie fans will appreciate the effort. First up, two bonus discs (a DVD and CD) complement and enhance the 10 films in this box set. The DVD houses the excellent, all-new documentary, Astaire and Rogers: Partners in Rhythm, an insightful 75-minute look at the duo's work together and separately. Fascinating nuggets abound in this well-constructed, artfully produced film, in which Rogers herself, as well as RKO studio chief Pandro S. Berman and choreographer Hermes Pan, appear in archival interviews. We learn Fred and Ginger shared a few dates in New York a couple of years before they were teamed on screen, and even after the success of Flying Down to Rio and The Gay Divorcee, neither was interested in a formal partnership. The documentary also touches upon Rogers' feud with frequent director Mark Sandrich, and new conversations with Astaire partners Joan Leslie (The Sky's the Limit) and Leslie Caron (Daddy Long Legs) give us an insider's look at Astaire's discipline and creativity. Liza Minnelli, Michael Feinstein, Marge Champion, Peter Bogdanovich, and Astaire's daughter, Ava Astaire McKenzie, also offer their perspective in this absorbing, clip-filled celebration. The CD provides a fine sampling of Astaire-Rogers tunes, but the song selection leaves a bit to be desired. Sure, The Continental won an Oscar for Best Song, but its merits are questionable at best, and even in blessedly truncated form it takes up eight precious minutes of disc time. (Other melodies, such as Isn't It a Lovely Day?, A Fine Romance, or They All Laughed would have been far better choices.) Of course, with a scant 45-minute running time, the CD certainly has room enough to include more cuts, and it's a shame its capacity wasn't maximized. Spotty sound quality also hampers the disc, but one must remember most of these recordings were made 70 or so years ago. They Can't Take That Away From Me from 1949's The Barkleys of Broadway is the best of the bunch, thanks in large part to a gloriously lush Conrad Salinger arrangement. The bonus discs, however, are only the tip of the extras iceberg. The set also includes meticulous reproductions of "campaign books" for Roberta and Shall We Dance. Originally distributed to major newspapers prior to a film's release, these multi-page clipping compendiums contain photos, movie ads, credit listings, posters, and full-length background articles on the movie and its cast. The Shall We Dance campaign book is packaged in its own slick commemorative folder, while the Roberta book shares space with 10 rare black-and-white glossy stills that take us behind-the-scenes of the Astaire-Rogers films. Shots of Fred and Ginger on set, chatting with composers George Gershwin and Irving Berlin, and relaxing between takes humanize this iconic pair and add another touch of class to this collection. There's even one of Rogers rehearsing with someone who looks suspiciously like Astaire�but don't be fooled, it's actually long-time choreographer (and dead ringer) Hermes Pan! The two-reel short Beer and Pretzels features comedian Ted Healy and His Stooges in a typically frenetic combination of slapstick (emphasis on the "slap") and music. Moe, Larry, and Curly are in fine form (though not quite as physically abusive as they would later become) as out-of-work vaudeville performers who wreak their unique brand of havoc on a restaurant when they sign on as waiters. Next up, the seven-minute cartoon I Like Mountain Music is a precursor of sorts to Toy Story, as it depicts how a rack of newsstand magazines come to life after closing time. Caricatures of Eddie Cantor, Will Rogers, Edward G. Robinson, and King Kong add spice to this inventive black-and-white animated short. An abbreviated trailer (ravaged by time, no doubt) completes the extras. The early Technicolor short, Show Kids, kicks off the supplements, and previews the Mickey Rooney-Judy Garland let's-put-on-a-show musicals that would captivate audiences a few years down the road. When a vaudeville house can't attract patrons, the proprietor's son lines up a series of kiddie acts to fill both the bill and the theater's seats. Some of the moppets possess real talent in this 20-minute revue, but most aren't any better than the tots at your local elementary school. Also in Technicolor (and also running 20 minutes), Star Night at the Cocoanut Grove takes place at the popular Hollywood nightclub and presents a series of acts that includes Spanish and Hawaiian dancers and vocal gymnast Johnny Candido (who also appears in Roberta). The real headliners, however, are Mary Pickford and Bing Crosby, who sings a typically dreamy romantic ballad. The six-minute cartoon Shake Your Powder Puff also adopts the variety show format, but it takes place in a barn and the performers are all farm animals. In addition to the film's original theatrical trailer, a Hollywood On the Air radio promo offers a lengthy array of musical highlights from the picture, including, of course, Night and Day. Starlit Days at the Lido is a lovely-to-look-at but rather dull early Technicolor short that presents several eclectic acts at an exclusive outdoor club. Robert Montgomery, Constance Bennett, and Clark Gable (seated with his much-older second wife, Rhea) are a few of the Hollywood stars forced to endure the performances. Up next, the vintage cartoon The Calico Dragon chronicles the adventures of a young girl's stuffed toys as they try to bring down a three-headed dragon, while a Hollywood On the Air radio promo provides audio clips from Roberta's score. Finally, the film's original theatrical trailer�in such bad shape that it looks as if it's ready to disintegrate�makes us appreciate the DVD's pristine transfer all the more. The two-reel short included here is the bizarrely entertaining Public Jitterbug No. 1, which spotlights a young and boisterous Betty Hutton and the marvelous tap dancer Hal LeRoy (to whom Astaire�much to his chagrin�was often compared) as a couple of kids with bad cases of swing fever. Chaz Chase is also on hand as a hungry partygoer who consumes such unappetizing items as lit matches, carnations, and shirt buttons. Thanks to a subpar print and muffled audio, viewing this antique is a bit of a chore, but the snappy tunes and tantalizing terpsichore make the effort worthwhile. The Looney Tunes cartoon September in the Rain also takes the Toy Story tack, showing how the items in a general store come to life after hours. An animated Fred and Ginger step out of cigarette packs to perform a lilting (and all-too-brief) number that captures their distinctive style to a T.
Buried Alive, a vintage short from 1939, chronicles the lengths a waffle-iron magnate will go to in order to secure a merger and marry the rival company's president, while the Tom-and-Jerry cartoon, Puss Gets the Boot, details an early cat-and-mouse battle between the lovable animals�so early, in fact, neither receive any billing, and Tom is called "Jasper" throughout the nine-minute animated short. A free mail-in offer to receive reproductions of four Astaire-Rogers movie posters�Top Hat, Follow the Fleet, Swing Time, and Shall We Dance�wraps up the supplements. "Heaven... I'm in heaven..." And that's where every other Fred-and-Ginger fan will be after they pick up this comprehensive, beautifully appointed box set. 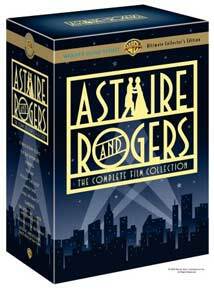 Astaire and Rogers: The Complete Film Collection combines the peerless artistry of the world's premier dance team with a wealth of exclusive collectible supplements to create one of the year's finest DVD offerings, and a package any serious film aficionado can ill afford to be without. Highest recommendation.